Good productivity on general tasks. Long and reliable battery life. Poor keyboard and uncomfortable touchpad. 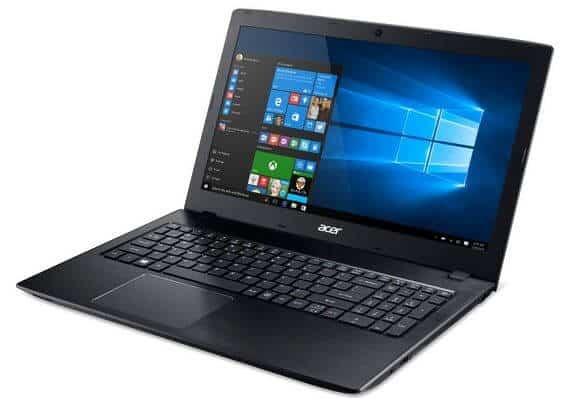 This laptop is one of the perfect gaming laptops retailing for around $600, the Acer Aspire E5-575G-53VG laptop has remained as one of the most decent machines around the world. It is a device made for quality gaming. The high-quality hardware, long battery life, and incredible performance are the basis of its world-wide fame. Featuring a premium, sleek and attractive look, the machine comes with a top-of-the-roost hardware. It is highly portable and competes fairly with the rest of the industry. Get a Core i7-powered device for a substantial performance. It comes with a flash-based Solid State Drive, onboard memory, and a stellar battery life. For a positive return on investment, the machine offers a host of upgrade opportunities. The tech market today is already crowded. Getting a good deal for your gaming needs is not an easy task. There are tons of choices available in the market today. The Acer Aspire E5-575G-53VG laptop has reliable specifications that are great for gaming. Below are some of the basics as far as the 15-inch Acer laptop is concerned. The Acer Aspire E5-575G-53VG laptop comes with a well-polished design. It is handsomely built and comes with an all-plastic chassis. There is a matte finish for a better feel and look. On some parts, the laptop has a polished and shiny look making it have a perfect look. The laptop is entirely plastic and thus as posh as the Dell XPS, MacBook, HP Notebook 1, Asus F555UA or any other metallic built laptop. This Acer Aspire 15 device is compelling in its design and looks when put against its rivals. The black plastic chassis comes with a subtle thatched pattern that is in between a shiny and a matte finish. The device appears unremarkable, which is a thing for most heavy-duty users. By design, the machine is not as bulky. It measures 15.0 x 10.2 x 1.2 inches and the 15-inch screen device can compete with its rivals fairly. 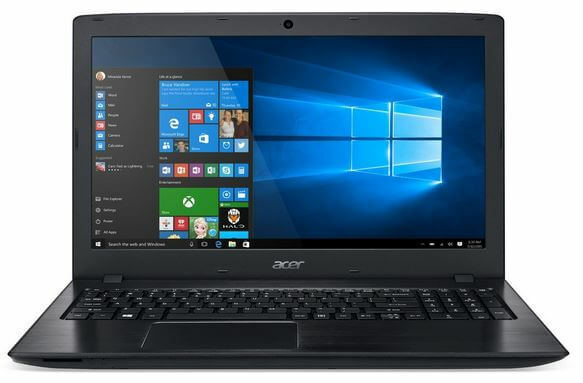 The Acer Aspire E5-575G-53VG laptop has sufficient ports for reliable connectivity with external devices. The machine has enough ports on the sides where there are three regular USB ports, HDMI port for the external monitor and one USB Type-C connector. The machine has an Ethernet port too for LAN network. You can use the SD card reader on the front, and the writable DVD drive on the right side. A minor complaint is a closeness between two of the USB ports making it difficult to attach multiple dongles in case they are large. The Acer Aspire 15 laptop features a modern, high-resolution and quality display. This is a device created to offer stealth, bold and vivid as well as vibrant colors thanks to its full HD display. The screen resolution is 1920 x 1080 making it the best for gaming and watching videos. It has a matte anti-glare coating that safeguards the screen from smudges and fingerprints. In our tests, it was easy to differentiate the pixel divots thanks to the fine details on the screen. The display has a ComfyView LED-backlight that has an aspect ratio of 16:9 – the ideal one! Acer Aspire E5-575G-53VG display panel can reproduce up to 95% of the sRGB color gamut. This is a reliable mark for a machine in its price range. In fact, it has been known to perform even better than most of the $1,000 machines whose mark is at 92%. The 1080p resolution is a real value for the 15.6-inch screen machine. On the colorimeter, our team got the machine reproducing up to 143% of the sRGB color gamut. This is a mark way above the HP Notebook 15 and Asus F555UA whose score was at 63 and 64 percent respectively. With only 195 nits of screen brightness, the display is dull. The category average is 250 nits with some of its competitors such as the F555UA scoring 223 and 220 for the HP Notebook 15. It is true to mention that the E5 panel makes a poor video. The color accuracy for the Acer Aspire E5-575G-53VG is not impressive too. The machine scored 3.26 Delta-E error rating. The ideal rating is closer to zero. However, the category average rating score is 4.44. Notebook 15 scored 3.5, but E5 lost to the F555UA’s 2.3 rating. There are limited screen options other than adjusting the general brightness, and the viewing angles are limited. The Acer Aspire E5-575G-53VG features a respectable 4.1 x 3.0-inch touchpad. It is inviting and looks great. However, many have complained of the rubber feel that is utterly resistant when using. It is difficult to move the cursor across the desktop. It feels slow to click using the touchpad. To be fair, the touchpad could handle the two-, three- and four-fingered gestures correctly. Acer Aspire E 15 comes with a standard keyboard. It is, however, mushy. There are no keys built in a concave fashion that allows for efficient typing. The subdued and plain finish on the keys makes the keyboard a mess. The specifications of the Acer Aspire E5-575G-53VG laptop make it a lucrative deal for many users. It is powered by the latest 6th generation Intel Core i5-6200U processor that clocks up to 2.3GHz. The Skylake CPU can build up to 2.8GHz on Turbo Boost technology. This is the best for the machine at its maximum throttle. The device is run by an 8GB DDR4 dual-channel RAM. This allows for multi-tasking without lags. The system memory is designed to pair up with the processor in an effective way for optimal performance. This makes Acer Aspire E5-575G-53VG a very fast and reliable laptop. Storing your files is not an issue with the Acer Aspire device. The machine comes with a cool 256GB SSD storage for fast access and program booting. It is an expensive but very convenient form of storage. You may opt for extra bucks to get a secondary hard disk drive if you need more storage space. Gaming on this machine is impressive thanks to the dedicated NVIDIA GeForce 940MX graphics processor. The GPU comes with 2GB of dedicated DDR5 graphics RAM, thus quality gaming results as well as a breathtaking video experience. The speakers are designed for loud volume. From a variety of songs, we could identify the constant volume from the in-built speakers. The audio is clear and effective for gaming and other entertainment uses. There is no profound bass, but the volume is high enough to allow for clear sounds. Acer Aspire E5-575G-53VG has an integrated 720p webcam that offer High Dynamic Range support. The camera is highly color accurate and can deliver a video free from lags while doing video conferencing. It is designed to offer quality selfie pictures. The sturdy hardware stuffed in the laptop makes it one of the most efficient laptops in the market today. It is one of the best machines you can ever get at its price range. From the processor to the RAM and graphics card, the machine will perform efficiently in all your daily office tasks, gaming and other entertainment needs. Regarding raw power, the Acer Aspire E5-575G-53VG performed pretty well on the Geekbench 3 test. Our review team identified that HP Notebook 15 scored 5,784 and Asus F555UA got 6,933. Both beat the Acer Aspire E5’s 5,663 scores. Worth noting, though, the F555UA comes with a powerful Core i7 processor thus better result. The Notebook 15 and Aspire have a similar CPU. In its category, there are other competing laptops. The HP Notebook 15 is a fair deal thanks to its attractive design. However, the device has less endurance compared to the Acer Aspire E5-575G-53VG machine. The Asus F555UA comes with fast and efficient Core i7 CPU, but its screen resolution is a mess – it comes with 1366 x 768-pixel screen. 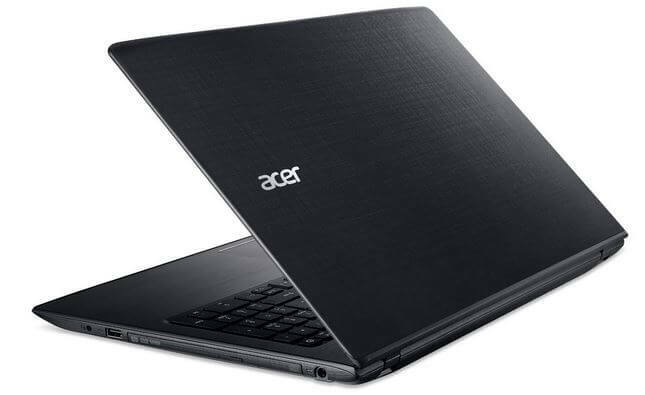 This leaves the Acer Aspire E5-575G-53VG as a better option in the category. You can get one for an affordable budget and reliable results!